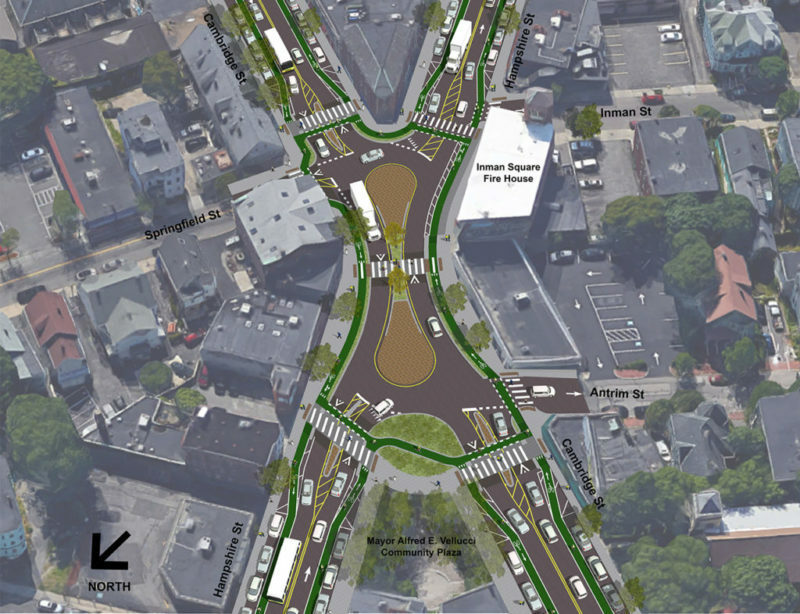 This week, Cambridge, Massachusetts, unveiled plans for a “peanutabout” that will make a tricky intersection with irregular angles safe for cycling. This type of design intervention could be crucial for locations that new research suggests are especially dangerous. In a study published in the journal Injury Prevention [PDF], a team led by Dr. Morteza Asgarzadeh of Harvard’s T. H. Chan School of Public Health found that non-right-angle intersections are especially prone to crashes that cause severe or fatal injuries to bicyclists. Asgarzadeh and his team mapped 3,300 injury crash locations in New York city involving a motorist and a cyclist. Then they analyzed the relationship between a number of factors and injury severity, including street width, weather conditions, gender and age of the cyclist, and posted speed limit. In most cases, researchers did not identify a significant link. But the researchers did find that a few conditions are correlated with more severe injuries. Crashes that occurred at diagonal intersections were 37 percent more likely to result in severe injury or death than crashes at right-angle intersections. In addition, while 60 percent of bike-car crashes happen at intersection, cyclists hit by a cars on straightaways — not at intersections — were 31 percent more likely to be killed or severely injured. The researchers hypothesize that crashes on straightways may be more deadly because drivers are traveling at a higher speed. They also found, not surprisingly, that cyclists struck by a truck or bus driver were twice as likely to be killed as those hit by a car driver. Asgarzadeh concluded that the findings bolster the case for protected bike lanes, which would shield cyclists on straightaways. They also suggest planning bike routes that have more right-angle intersections and giving cyclists a dedicated signal phase at non-right-angle intersections. More peanutabouts may also be in order. Randal thinks we should invest in highways because they’re getting to the “end of [their] service life”… and this shouldn’t apply to transit because of…er… freedom, liberty, and limited government, Federalism, the Constitution, or something like that? Let them roll back the standards. The market is already quickly leaving ICEVs in the dust, so if the automakers want to dither on bringing more efficient cars to the public, they’re just going to lose market share. Making Transportation Safer for "Invisible Cyclists"
Will New Haven Replace a Highway With Highway-Like Conditions?